Truthfully, I never dreamed of being in real estate. At 19 years old, the idea of being stuck in one small town to build up my “brand” as the up-and-coming, go-to real estate agent for my friends and first-time home buyers was the last thing on my priority list. I wanted to be free to travel and roam the world wherever I pleased. And yet, at 20 years old, I found myself working in my parents’ real estate business – at first helping out with bookkeeping and tech-y things, but eventually getting licensed so that I could work as their buyer’s agent. To be fair, I didn’t find myself in that position without my own doing. I thought that was the end of my burgeoning real estate career. And so, back to school I went. 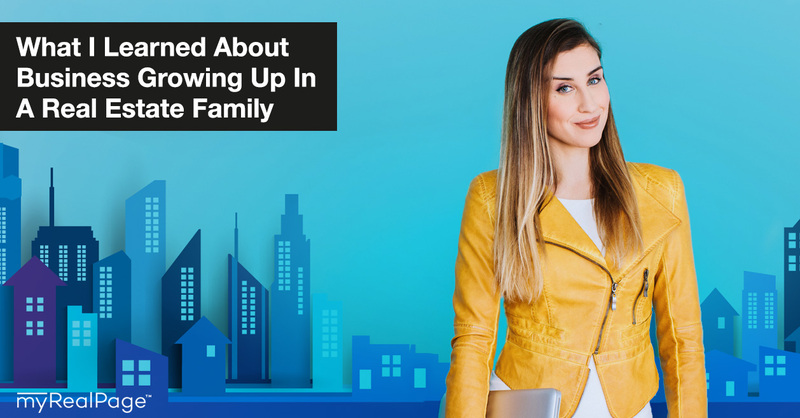 But 10 years later, I’ve carved my own entrepreneurial path of sorts – and on a consistent basis, I’m reminded of what I learned growing up as the offspring of two realtors. Their hustle, insane work hours, creative marketing ideas, and authenticity while selling are just a few takeaways I’m cognizant of while building my own business. 1. Your best next client is a referral. In any kind of business, it goes without fail: when a former client enthusiastically sends people your way, the chances of them becoming your next client are ridiculously high. Why? The selling’s been done for you! Your former client has given you the official thumbs-up – which is much more effective than you telling someone who has no idea who you are that you’re even worthy of a thumbs-up. With the hard stuff out of the way, all that’s really left to do is meet the referral, ensure they’re a right fit for your services – and you’re golden. 2. Give your current clients an unforgettable experience. Following the first point, it’s clear that the most effective growth strategy is to ensure your current clients never forget you. Give them a unique, special experience, and they’ll not only come back to you for your services again in the future, but will be sending you all their friends in the meantime, too. In a saturated market, it can be tough to know what makes you stand out from the rest. But that’s where the creative fun comes in! Brainstorm ways you can make each client experience unique – from your customer service style, all the way to your closing gift. What’s the fastest way to build trust with someone? Open up and be relatable. This lets them feel like you’re being real, genuine and… trustworthy (which you are!). Knowing which facets of your life you’d like to open up about – whether it’s in your online marketing or in your conversations with your clients – is a good first place to start. Hint: choose the stories that speak to your target client, and support the brand that you’ve created for yourself. Then, weave those stories into your conversations, blogs, videos and in-person conversations. Open up, be real, and see how your clients respond. 4. You gotta get out there. Ah, the old art of networking. We all know we need to do it. But as an online business owner, I like to skirt around this pesky task by telling myself that I accomplish “networking” by yapping online in various ways – through blogs, videos, or captions. What I’ve come to learn is just like in my parents’ real estate business, the best connections come from in-person interactions. In my world, this sometimes means heading to meetup events where my target audience might be. Or buying into someone’s program so that I can get tapped into their network and all the people drawn to them. Or, just socially going out there for drinks with friends (of friends). All these circumstances are opportunities for me to connect with my target audience IRL (in real life, according to Internet slang), and those person-to-person connections tend to have the highest ROI in the long run. 5. If it’s not in a contract, it’s not happening. We all know this one as well. But it’s something I learned from my parents way back when, and incorporated into my business from day one. It can initially be awkward when you’re just starting out, and are talking with a friend about doing a teeny, tiny project together. It’s much easier to want to skip the contract phase because – hey, you’re friends! What’s going to go wrong? I’ve been fortunate to avoid any sticky situations with clients, and maybe it’s because of my contract commitment or maybe I’ve just been lucky – but either way, I know that if that day were to come, at the very least, I’ve always done my due diligence in protecting myself and my business by having everything signed on paper. 6. Boundaries. Create ‘em. Use ‘em. I struggle with this one to this day. And I saw my parents struggle with this one as well. How many nights did I see my mom poring over contracts at her computer, or rushing out to showings after Sunday dinner? Countless. I saw that she actually loved business, and by osmosis, I probably absorbed some of my love (and obsession) with business from her as well. But as the sands of time pass through the hourglass, I’m learning that my business is not my life. My business supports the life (and lifestyle) I want to create for myself. But it isn’t what drives my life. Now, I no longer use my “busy-ness” as a barometer for my success. Instead, I use boundaries. To give myself ample time in my day to work, and to also play. Today, I see my parents doing the same. Their priorities have shifted, and while running a successful real estate business is still important to them, having free time to spend with family and friends is – in the end – the most important.